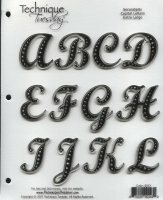 The use of Fonts for Scrapbooking has grown tremendously over the years with computer technology. Web sites have appeared that cater to purchase and distribution (sometimes for free) of many new fonts that are being created everyday. 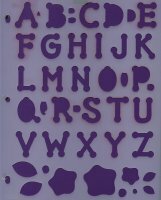 Fonts are available on CD's, as stencils, in rubber stamps, and stickers. Fonts can also be drawn freehand with Scrapbook Journaling Calligraphy Pens following certain pre-made designs. This is the CK Creative Lettering CD package. The cost of this CD runs about $40, and provides really nice, easy to use ideas specially for Scrapbookers. It was easy to install and can be used on either Windows or Macintosh. On the inside are colorful examples of all the fonts. They can be colored with 25 different colors and filled in with 25 different fill patterns. Also available are 50 shapes for enclosing your scrapbook journaling called Journalettes. This CD from Creating Keepsakes was part of a gift package for attending the CK Convention in Charlotte NC in the summer of 2010. The retail price on this one says $24.95. 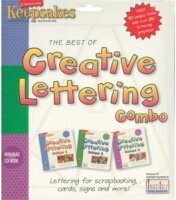 A few Scrapbook Tips & Advice when using Computer or other printed Fonts for Scrapbooking. 1. Look through what is available to find something that goes with your theme or context of your scrapbook layout. Remember, if it's heritage, try to use one of the older fonts. If it's technology, use something that looks like a computer font. If it's masculine, don't use a script with a lot of flourishes. 2. Make your font easy to read. Have you ever read something wrong or just couldn't make out what the words were supposed to say because the font was maybe too fancy? Just like a difficult hand writing is hard to read. After all, you are doing your journaling for some one to read later to identify what is going on with your photos, the event, the people, the news, the scores, the times, etc. You want it to be read. 3. Try to keep your font limited to one per page and only 2 or 3 sizes. It just makes for easier reading and provides consistency without detracting from the photos and art work. Now if you are doing and entire themed book, you may want all your titles in the same font, with a different font (or size) for the captions and text. If you do this, at least try to be consistent through out the book. 4. Print your Fonts For Scrapbooking out on plain paper first to make sure it will fit into the space you want it, is the color you want, is easy to read and just to proof read it. Don't forget to use spellchecker. I can't tell you how many times I have thought a document was OK while it was still in the computer and then noticed some errors once it was printed out. Here are a few computer web sites that provide access to fonts. 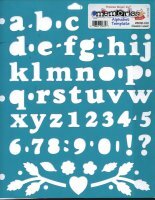 1001 FreeFonts.com will provide you access to free scrapbooking fonts and over 10,000 fonts to download very easily for $19.95 through what they call the Ultimate Font Download. They have been around since 1998 and can also provide you with Signature Fonts and Handwriting Fonts. Have you seen a font you want to use but don't know the name of it or how to find it? They have a Font Search Engine with over 30,000 commercial fonts available. And if you are a McIntosh user, 100% of their fonts are Macintosh compatible. Acid Fonts has over 4700 free scrapbooking fonts that can be download. They are stored Alphabetically and by Category. You can see graphical examples of each of the fonts. They are also both PC & MAC compatible and provide help for you to download, convert and install fonts. Their Font Categories are: 3D, Christmas, Dingbats, Graffiti, Grunge, Halloween Horror, LCD, MAC, New, Number, Outlined, Retro, Sci-fi, Stencil, and Valentine. Fonts.com is another nice website for accessing and learning about fonts and their designers. Their fonts are organized by font type, like Technical, Western, Scary, Grunge. Kids, Formal Script, and Languages and by name. If you don't know the name of the font you can search for it. There are areas to learn about the Designers, Articles and News on fonts and they even have a newsletter that periodically announces new fonts and discusses their designers. Downloading is quick and easy and they are PC and Mac compatible. Want to try your own Handwritten Fonts for Scrapbooking? Check out this page on Calligraphy Pens and a book on how to do your own Calligraphy at Scrapbooking Pens. 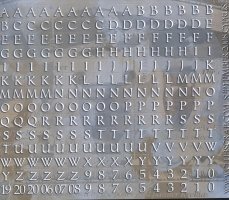 Stencils are also available in various types and sizes of Fonts as well. 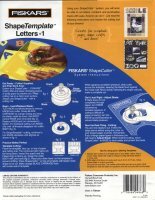 Here are a few by Fiskars - Shape Template Letters that come in upper and lower case, with numbers also, and are meant to be used as a system with a Fiskars Shape Cutter and Cutting Mat. Using the Shape Cutter System, you can actually cut paper and card stock without scissors and use the cut out letters to embellish on your scrapbook pages. They are about 1/8 inch heavy plastic and are designed to fit into a three-ring binder for storage. 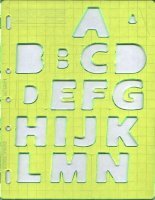 Other kinds of Fonts For Scrapbooking Stencils are available like those shown below that can be used to trace letters directly to the scrapbook paper with pen or pencil. Or they can be traced and cut with a craft knife or small scissors for use on your page. 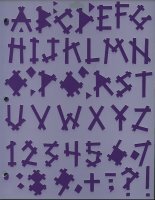 The two Fonts for Scrapbooking shown with the purple background are from E K Sucess, the one is the center is from Frances Meyer. Rubber & Acrylic Stamps, both mounted and unmounted, come is various types and sizes of Fonts as well. These acrylic letter stamps from Technique Tuesday are the font Serendipity, Capital letters, Extra Large. They come on a clear plastic sheet for storage in a 3-ring binder. 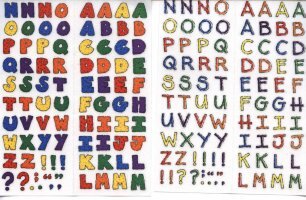 These unmounted rubber letter stamps from Club Scrap are the font Centennial from 2007. These were purchased to go with a the Club Scrap Centennial Kit also issued in 2007. Each of their sets of unmounted rubber stamps comes with a complete page of images. These were cut apart, prepared with "Aleen's Tack it Over & Over" on the back and are stored on a clear plastic sheet protector for storage in a 3-ring binder. Here's a quick link for instructions in how to cut and mount any unmounted stamps with the Aleen's. And last but not least, the Fonts For Scrapbooking also come in stickers and sticker squares, also in many sizes, shapes, colors and fonts. These Club Scrap letter stickers from the September 2008 Cyprus kit from Club Scrap.com match the unmounted rubber stamps they provide with the kit as well as the text printed on the papers. These Fonts for Scrapbooking have a shaded background that match the several colors of grey, white and blue papers in the kit. 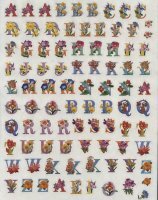 These Tiny Type stickers by K & Company have flowers as part of each individual letter. Also on the sheet are whole and 1/2 space spacers, both plain and floral to help you properly space out your scrapbook journaling. Here is another set of floral font stickers by Current, Inc. called Floral Initial Caps. These are printed on a clear background and will allow the color of your background paper to show through the sticker. 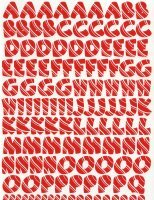 Another set of Fonts for Scrapbooking by Current, Inc. called Candy Cane Stripes. Always good to have something on hand for the Christmas Holiday. 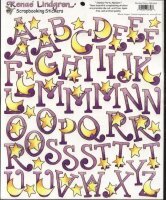 These Fonts for Scrapbooking stickers by Renae' Lindgren are called Slumber Party. They are diecut from the white background, including the centers, so all you see when these are applied is the sticker itself. These little stickers in both bold and thin would be great to use on a school scrapbook layout. There is no name or manufacturer information on these. There are many options to use for your Fonts for Scrapbooking. I have just tried to show you a few of the options and let you know where they came from and what they are called. I hope you enjoy looking for just the right kind to embellish your scrapbook pages. Check out our Scrapbook Fonts Store for some more ideas on Journaling, using different Fonts, and even embellishing your Scrapbook pages and cards with the newly popular Doodling and Flourishes. Check out Scrapbook Journaling for more ideas. Look at Journaling & Scrapbooking Pens for more tools and ideas. has over 70 Themed Albums for ideas.